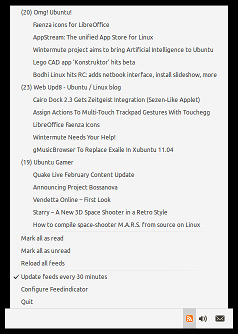 RSS feed updates in the indicator area. You can download deb package from here once you have deb package install by double clicking on that. If you have a problem with a particular feed crashing the indicator, edit this file: ~/.config/feedindicator/feeds.cfg and remove the problematic url from the list.